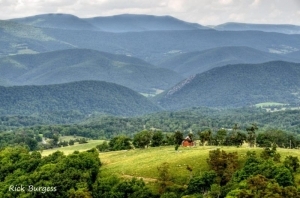 Burner Mountain, in northern Pocahontas County, is part of the Allegheny Mountains and reaches an elevation of 4,293 feet. The east and west forks of the Greenbrier River divide at Burner Mountain. Durbin, West Virginia, is located at the southern terminus of the mountain at the forks of the Greenbrier.